The Northern Saw-whet Owl is the smallest bird-of-prey in North America. The male is about 25% smaller than the females and weighs about as much as an American Robin. Like most owls, the Saw-whet is active at night, and hunts from a low perch waiting for a woodland mouse to move nearby. During the day it usually roosts in dense evergreen trees. The Northern Saw-whet Owl breeds in the forests of the west and the northeast. The mountains of Tennessee and North Carolina represent the southern limit of that range. In winter the northern-most breeders migrate southward across the United States. Description: The Northern Saw-whet Owl is a small, round headed owl with a pale face, outlined in brown. It has yellow eyes, the upperparts are brown spotted with white, and the pale breast has brown streaks. Voice: The song is a long series of mechanical to-to-to-to, often repeated more than 100 times! Eastern Screech-Owl is nearly as small, but has ear tufts and black streaking on the chest. Habitat: In Tennessee, most nesting records are from high elevation (above 5,000 feet) in spruce-fir forest. During migration, they have been captured in mist nets in deciduous and mixed forests primarily in Middle and East Tennessee. Diet: Primarily eats woodland mice, but occasionally some small birds and large insects. Nesting and reproduction: Northern Saw-whet Owls are monogamous and raise a single brood per year. Clutch Size: Usually 5 to 6 eggs, with a range of 4 to 10. Incubation: The female incubates the eggs for 27 to 29 days, while the male brings her food. Fledging: The male feeds the young for the first 2 weeks and then both adults feed them. The young fledge at 27 to 34 days and will stay with the adults for at least a month. Unlike most owls, fledglings can fly reasonably well immediately after leaving the nest. Nest: Northern Saw-whet Owls nest in tree cavities, usually old woodpecker holes, especially those of the Northern Flicker, and will accept nest boxes (see link below). They add no nesting material but wood shavings should be added to new nest boxes. Status in Tennessee: Locally rare permanent resident in the mountains of East Tennessee, and a rare migrant and winter resident across the state. Due to its small population size, it is listed as Threatened in the State of Tennessee. When a Northern Saw-whet Owl is discovered roosting in a dense conifer, its defense is to sit still and not fly. This has lead people to perceive them as "tame." 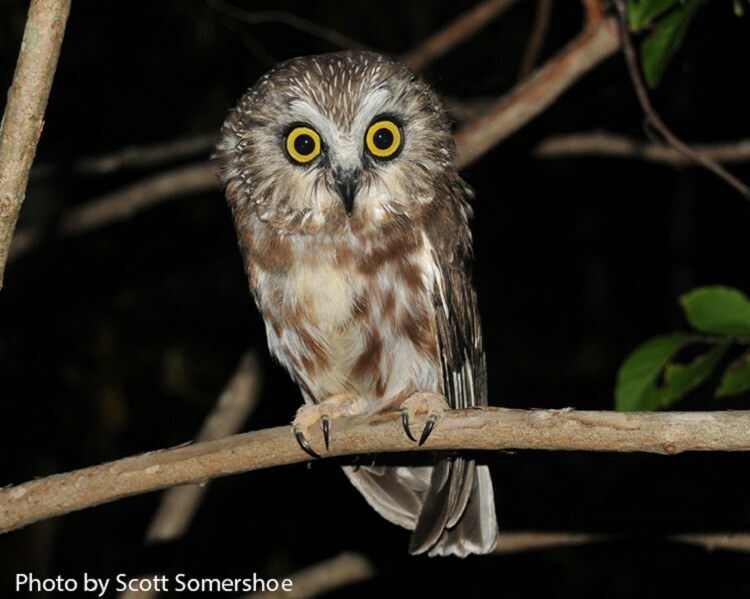 The oldest known Northern Saw-whet Owl in the wild was 10 years, 4 months old. When the female Northern Saw-whet Owl is incubating the eggs and brooding the young, the male brings all her food. She only leaves the eggs and young once or twice a night for a short trip to defecate and cough up a pellet. When prey is plentiful in winter, Northern Saw-whet Owls will kill up to 6 mice and hide them in a safe place where they will freeze. Later, when food is less plentiful, they will thaw the mice by "brooding" the frozen carcass, and eat them. Best places to see in Tennessee: The best place to see a Northern Saw-whet Owl in Tennessee is on Roan Mountain near the North Carolina line, and on the road from Newfound Gap to Clingman's Dome in the Great Smoky Mountains National Park. They are most likely to call on clear nights, with some moonlight, and little or no wind, in April and May. Rasmussen, Justin Lee, Spencer G. Sealy and Richard J. Cannings. 2008. Northern Saw-whet Owl (Aegolius acadicus), The Birds of North America, No. 42 (A. Poole, and F. Gill, eds.). The Academy of Natural Sciences, Philadelphia, PA, and The American Ornithologists' Union, Washington, D.C.